Ever since the opening of the Guggenheim-Museum in Bilbao in 1997 urban managers all over the world have been trying to re-create its impact by commissioning ever more extravagant buildings as a means of branding their cities. Largely un-noticed the perception of this so-called “iconic architecture” is very much influenced by the availability of adequate photo-opportunities that allow convenient, yet nonetheless spectacular images to be taken and subsequently disseminated in large numbers via social media platforms by tourists and other visitors. Taking Hong Kong as a starting point and case study this essay looks at the background, nature and workings of such urban photo-opportunities, and comes to the conclusion that potentially the photo-opportunity may even work – in terms of shaping the perception of a city – without any especially iconic building at all. Not long ago, during a break in one of my classes, I noticed that one of my mainland Chinese students was smoking a Chinese brand of cigarettes sold in a tin can, rather than the usual cardboard pack. While this in itself initially would only warrant a brief glimpse of attention, what got me excited was the imagery on the can: a photo of Hong Kong’s Victoria Harbour. 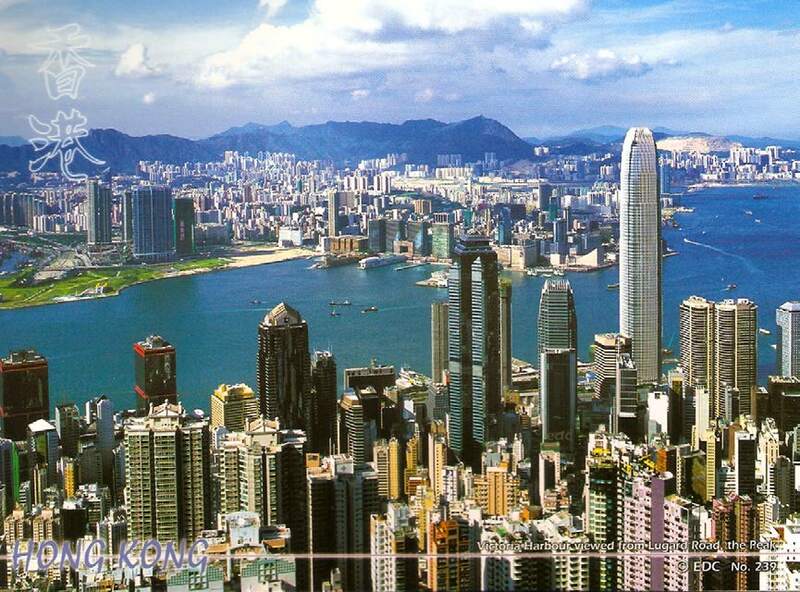 The picture shows the Northern shoreline of Hong Kong Island from a raised viewpoint on the Western part of the island, with the Hong Kong Convention and Exhibition Centre at its centre. Now, why is that remarkable? Because this picture was unseen before. By this I don’t mean to imply the photo to be a fake. A fairly simple triangulation based on the positions of certain landmark buildings indicates that it could’ve been taken from somewhere around Victoria Peak. Yet it doesn’t really matter, for all I know the image is authentic. Instead my surprise is quite literal: a picture from this position, this angle and height is not commonly seen – or in a reversal of roles: not commonly shown – as it misses the point of Victoria Harbour: Hong Kong Island’s breath-taking skyline. This particular shot is exponentially less visually attractive than any shot taken from a position perpendicular to the shoreline, and therefore any “normal photographer” wouldn’t bother to take it. – the picture is taken from a position in the mountains behind – i.e. 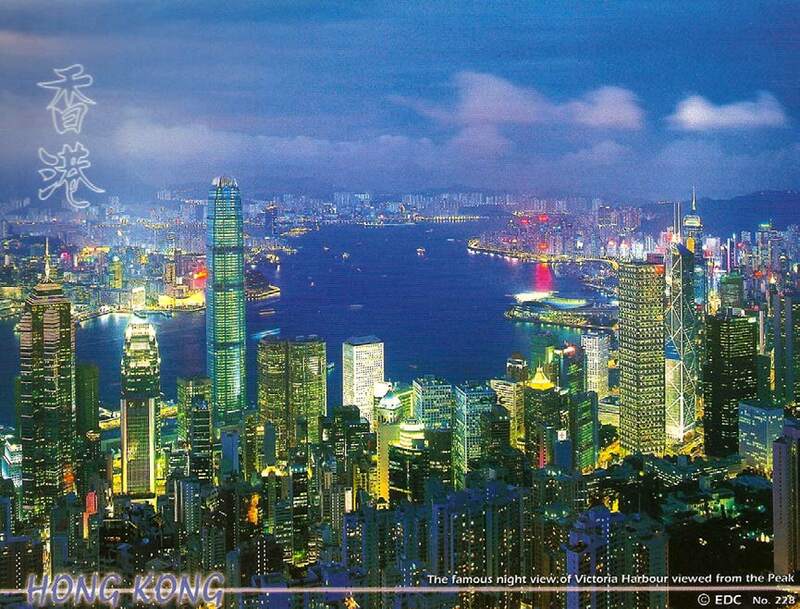 south of – the Central-district on Hong Kong Island. In the latter case almost every single picture – by professionals and laymen alike – can be traced to be taken from the one same spot, the roof of the Peak Tram station, or from a small viewing platform located slightly east from there. 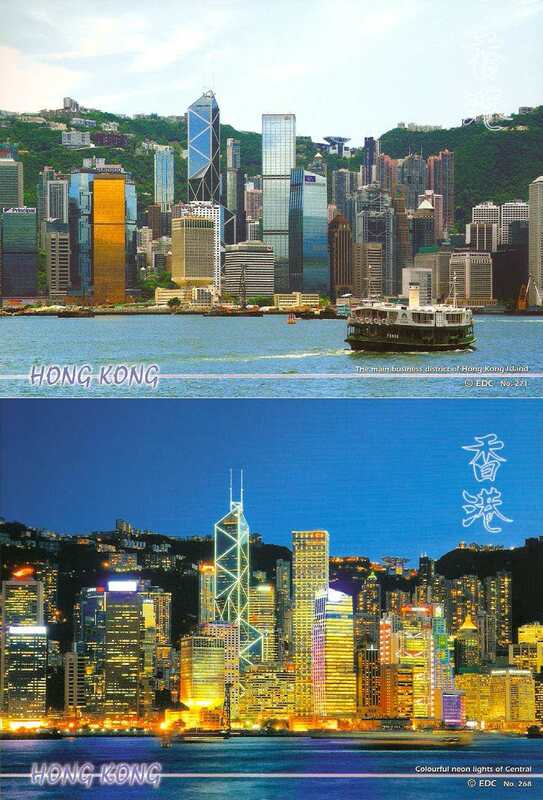 This observation – that the first, say, 100 images of Hong Kong skyline found by Google are more or less all taken from only two different vantage points, but by different people at different times – is indeed very notable, and, I believe, warrants the question: why would that happen? In recent years much has been said and written about ‘iconic architecture’, and poor Frank O. Gehry hasn’t stopped cloning Guggenheim-franchises all around the world ever since the ‘Bilbao-Effect’ impacted in 19971, 2. The exteriors of his buildings and those of his star architecture peers apparently manage to attract the visual imagination of the general public, which reflects in their continuous photographic representation through all media and platforms. These buildings thus lead a trend that approaches an urban environment merely as a potential for photo-opportunities. According to the American columnist William Safire the term ‘photo-opportunity’ was coined by a White House-aid of the Nixon-administration, when inviting the press (=the public) to pre-arranged, carefully staged occasions for picture-taking with the US-president in the Oval Office of the White House3. The practice as such is of course much older: While there is a grey area of what is to be defined as a ‘proper’ photo-opportunity the scheduling of such photo-sessions in the White House can certainly be traced back at least to the presidency of Franklin D. Roosevelt in the 1930s4. In times of the Great Depression and subsequently the Second World War it was deemed necessary to visually present the public with a physically capable, strong (=healthy) leader on top of the political situation – yet Roosevelt was essentially paralysed from the waist downwards. Therefore before any press-encounter the President would be propped up – seated behind his presidential desk, or even ‘standing’ against a console – while the photographers were placed in particular positions within the office that would only allow certain picture angles etc. This would also allow the arrangement of a background fitting for the occasion, particular props to be recognisable on the desk, and other visual accessories to be in place. Roosevelt’s example is evidence for the principal intention, and the ultimate success of the practice of photo-opportunities: In total only two pictures are known showing Roosevelt in a wheelchair, and up until today most Americans – and yet more non-Americans – are not aware of President Roosevelt’s disability. Considering the press-exposure the American president also had in the 1930s/40s, this must be acknowledged as a very impressive achievement: almost perfect control of the photographic image. There has to be a clearly identifiable photographic object. This is – obviously – a key point of any photo-opportunity, though not always quite that easy or plausible to produce. For example it is the nature of many a public events to be essentially intangible, multi-layered, and very complex, thus not possible to be condensed into only one picture. The photo-opportunity therefore needs to provide an iconic substitute that can stand for the essence of the event in total. It appears, pretty girls in short dresses have unlimited potential to do just that. The photo object is presented within a spatially defined setting: A room, a stage, a particular furniture, all of which effectively mark the frame for the picture. The setting will usually specifically differ from the further environment, be it through actual spatial features (surrounding walls, a raised platform etc.) or merely through a starkly contrasting style of the set. The optimal position for the photographer is made very obvious, sometimes blatantly through a ‘view point sign’, often more subtly through the spatial arrangement of the situation. For example the default backdrop will inherently allow only for one (main) direction to see the object of desire etc. In all cases the minimal expected quality for a ‘perfect’ photo-position will be an un-obstructed view of the object of interest, but often more than merely that is offered: particularly exciting shooting angles, special lighting, closer proximity to the photo subject etc. A photo-opportunity also is generally accessible, i.e. the public or at least its representatives knows about it and can easily find it, get to it, and thus participate. Now, while the common self-respecting, anti-authoritarian, anti-consumerist, politically educated position usually dismisses the photo-opportunity as a deeply fake and potentially vulgar occasion, it really is a most interesting phenomenon that allows revealing insights into the ways images are built and realities are constructed through clever manipulation of our primal visual urges. After all it shouldn’t be forgotten that no photographer – professional or amateur – is forced to make use of a staged photo-opportunity; participation is principally voluntary, he/she could always take pictures at other times or places. Yet: a well-planned photo-opportunity will be visually thus alluring that every red-blooded photographer in his right mind will instinctively ‘jump at the opportunity’. With today’s wide spread availability of digital cameras, camera-equipped mobile phones and all, even more people regularly produce continuously increasing numbers of photos. A new dimension to Sontag’s equation was added in the last decade through online image distribution opportunities, in particular of social networks and photo-sharing platforms. Taking a picture, and posting it on the Internet proves one’s presence at a location; the more spectacular the picture, the more prestigious to have been there. As a result contemporary ‘icono-obsession’ has become an issue for architects, city planners, and in particular urban management, as it can dramatically influence public acceptance of new infrastructure, and/or affect the international image of a city or region – as impressively shown by the Guggenheim in Bilbao. Accordingly, control over photographic imagery of buildings in professional magazines, official publications etc. is common professional practice of the field6 – and also explains the professional obsession with photorealistic renderings. However, it is of course a lot more problematic to control the average citizen/tourist who will take pictures at whim, and publish them on all sorts of platforms on the internet, thus contributing to a gradually developing grass-root perception of a building and/or city. Problematic – unless one employs the tools of the photo-opportunity: Take a fairly coherently designed built entity, place it on a slightly raised platform in front of a more or less homogenous cityscape, provide an un-obstructed line of sight, and on this axis – preferably in a distance that suits the focal lengths of the most common cameras – put a sign ‘view point’ or – more sophisticatedly – install a visitors’ platform. Soon after tourist coaches will begin unloading their passengers there, and a little later Facebook, Instagram, Flickr and their likes will be filled with variations of the same recurring photo. If this sounds too simplistic: Take the time to search images of successful examples of ‘iconic buildings’ online (e.g. Guggenheim Bilbao, Sydney Opera – the mother of iconic buildings – etc. ), and evaluate them on the photo-opportunity criteria outlined above. In case you have even a little more time: look up satellite images of the same buildings, but this time focus on the place opposite to the building, at the other end of the visual axis. You’ll usually find a platform, promenade, or other kind of view point in convenient distance. This suggests the possibility of a quite remarkable theoretical twist: might it be the existence of a photo-opportunity that indeed establishes the significance of the architecture it puts in scene? Potentially not the actual quality of the building is of relevance, but its photo-sensitive staging within its urban context? Thinking about it, this wouldn’t really be a surprise as essentially this is what happens all the time at the scale of product presentations and such like: a pompous photo-opportunity makes the product look more desirable than it actually is. Why should this be different for buildings or entire even an entire city brand? Ever since Guggenheim in Bilbao in the late 1990s urban managers around the world have tried to re-create a similar impact for their own city by commissioning ever more extravagant architectural projects. Yet there might actually be an easier way: Could urban photo-opportunities potentially also work without particularly iconic buildings as long as a convenient photo-spot is provided? That is to say: would people take pictures of essentially any urban scene if triggered by the cue that is a photo-opportunity? Thinking this further: could it be that a city like Detroit continues to deteriorate exactly because the authorities didn’t provide a photo-opportunity that may generate a continuous and coherent stream of positive imagery of the city? Because of the lack of such opportunity people go out on their own searching for photogenic images, and quite expectably come back with ever more photos of picturesque decline, thus effectively contributing to an incoherent, fractured, out-of-control image of that city. Provided with this background, you may now understand my excitement about the image on the Chinese cigarette can: Hong Kong does have its photo-opportunities with a proven track record of impact. Yet that particular image seems to suggest that at least one photographer, and subsequently a graphic designer, an art director etc. resisted the proven visual power of a photo-opportunity, and gave preference to an entirely different view. Is this proof of photographic freedom? Unfortunately, probably not. As mentioned at the very beginning of this text the student smoking the particular brand in question was from mainland China as is the cigarette tin. And it is essentially this detail that proves that the photo-opportunity does after all executes its power also in this case. 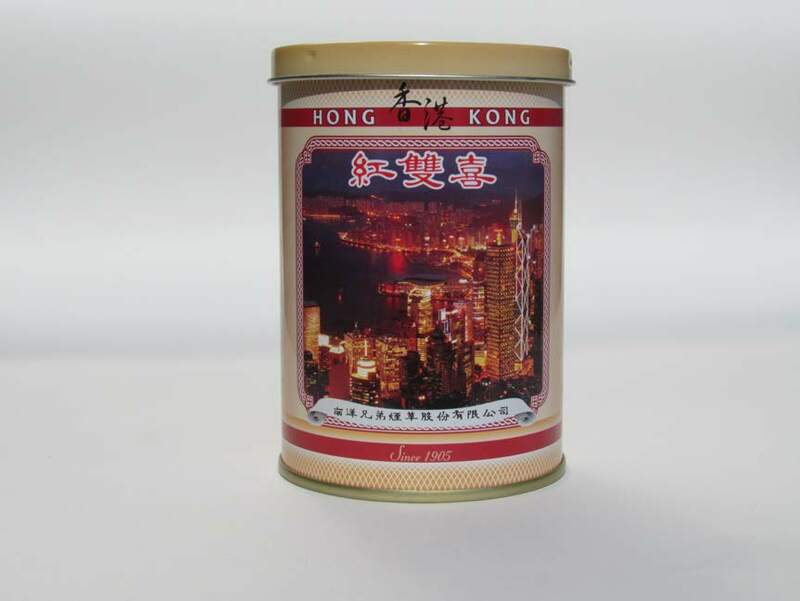 Hong Kong’s return to China up until today is a major propagandistic achievement in the mainland, thus an image of Hong Kong on a tin of a Chinese cigarette brand call Double Happiness has to be understood entirely un-ironically. Obviously no visual match to the Bilbao Guggenheim of the same year, the HKCEC purposefully is present in many photographic representations of the famous Hong Kong Island skyline because of its position on reclaimed land right in front of the actual skyline; and because the local administration was clear-sighted enough to also have an extensive visitors’ platform built on the opposite side of the harbour. Visitors could take pictures from anywhere along the Kowloon-side harbour front, but because there is this elaborate platform in this particular spot – with all accessibility etc. – they will usually take them from there. 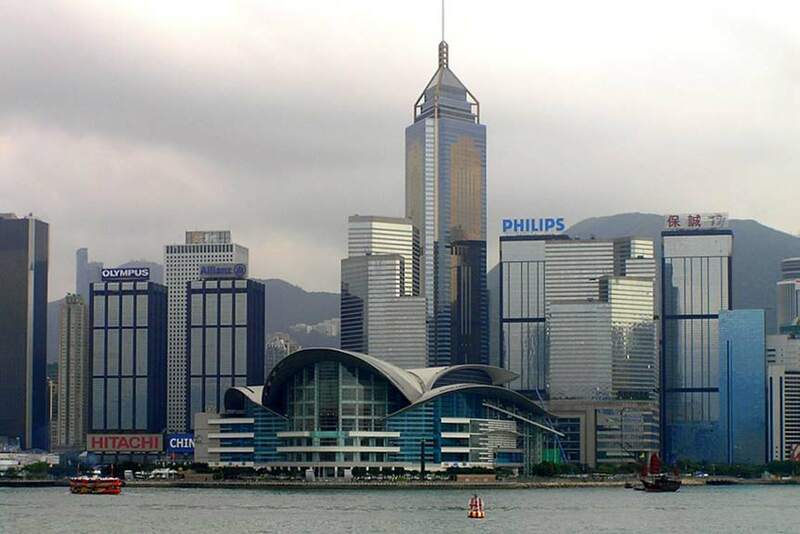 However, from a mainland point of view the “classic” skyline view is symbolically and visually problematic: the HKCEC doesn’t stick out enough, doesn’t achieve the visual singularity it was built to demand; and the backdrop is littered with wrong references – a bit like a Gucci-handbag in front of a Louis Vuitton-backdrop. 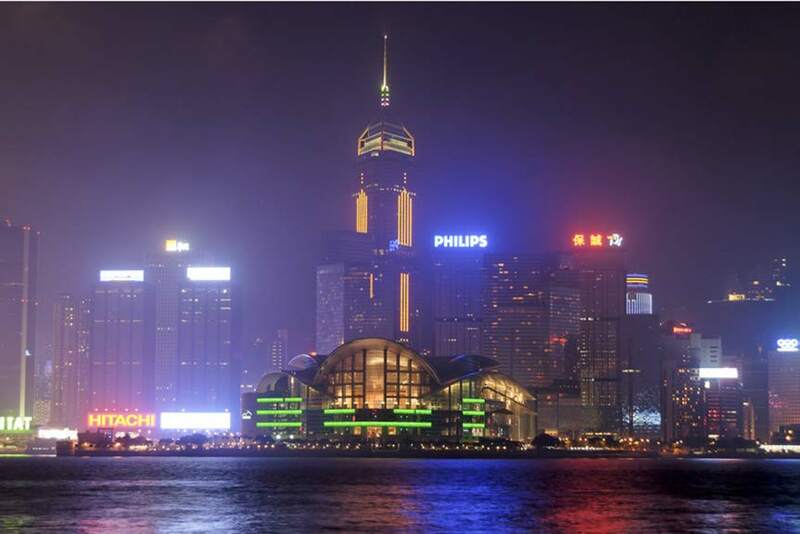 Thus the creative achievement of the photographer of the tin-image is to have found a third photo-opportunity for Hong Kong’s skyline, one that conforms with a particular political message: the extension of the HKCEC, the brightest light amongst the abundance of light in Hong Kong, set apart by the dark calm sea, yet still embraced by the city. A clever government will make sure to identify this photo-spot, and to grace it by an elevated viewing platform as well as access to public transportation. In no time mainland tourists will arrive in troops, but as their photos begin to flood social media platforms, others will want to join, and soon images with a slightly different message about Hong Kong will challenge the traditional dominance of the old skyline.